Motorized scooters give people with mobility limitations more independence by making it easier for them to go places on their own, or with limited assistance. If you haven’t purchased one already, consider a scooter lift. With a lift, you’re able to get up and go whenever, and wherever you choose. Here are a few things to think about when shopping for scooter lifts in Louisiana. What Are My Options to Travel with My Scooter? You do have options to transport your motorized scooter. One option is a carrier, which is a platform that attaches to the outside of your vehicle. You drive the scooter up onto the platform and secure it, allowing safe travel on the vehicle. You can also purchase a platform mobility lift. This type of lift requires you to drive, or wheel your scooter onto the platform. Then, the platform moves the scooter into the vehicle. One advantage to this type of lift is that you can remain seated on your scooter while the lift moves it into the vehicle. Another popular style of lift is one that easily attaches to the hitch mount on your vehicle. Similar to a bicycle transporter, this lift is adjustable, and allows you to transport multiple types of mobility equipment. Does My Vehicle Need a Hitch? If you purchase the lift that attaches to a hitch mount, you will need to either already have a hitch on the vehicle, or discuss having one installed. While many trucks and some vans already have a hitch mount, some cars cannot accommodate a hitch. A dealer that carries scooter lifts should be able to take a look at your vehicle and determine whether a hitch can be installed. The scooter lift that attaches to a hitch mount requires the least amount of modification to your vehicle. A carrier lift will require special installation, performed by a technician trained to work with lifts. You may be able to attach a hitched lift, but should never attempt installation of the other types of lifts. Will Medicare Cover My Scooter Lift? 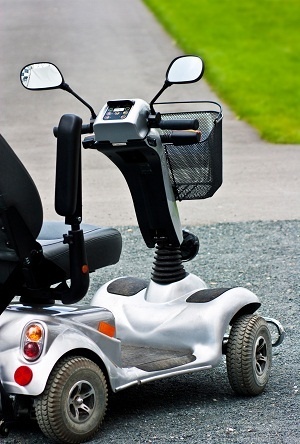 Medicare may cover part or all of the vehicle modifications for your scooter lift. Coverage is dependent on a physician certification, among other things. Check Medicare’s online coverage tool to help you understand which items and services are covered. Also, check with your state’s Medicaid program. Some states provide a waiver to cover vehicle modifications. If you’re considering purchasing a new vehicle, some manufacturers offer programs to help cover part of the costs of vehicle modifications. It’s always best to check with your doctor, Medicare, and Medicaid to get help determining whether you qualify for assistance purchasing scooter lifts in Louisiana. A scooter lift is a purchase that will be worth the time you spend shopping for it, as it will give you more mobility options, and more freedom.